BERLIN, Germany -- Germany's foreign minister has called for "rebuilding trust" among OSCE members, including Russia. He described Germany's plans to lead the organization during "one of the severest crises in Europe's security order." 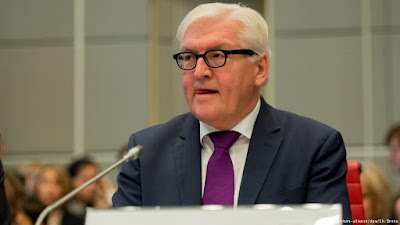 German Foreign Minister Frank-Walter Steinmeier announced Germany's plans to steer the Organization for Security and Co-operation in Europe (OSCE) as it assumes the 2016 chairmanship. "I am convinced that we need the OSCE in these turbulent times of insecurity and new challenges," Steinmeier told delegates of the 57-nation organization. "The German foreign minister - and now OSCE chairperson-in-office - discussed the conflict in eastern Ukraine as one of the organization's biggest challenges in 2016. "We don't need a dialogue about dialogue, but a dialogue that doesn't cover up violations of central OSCE obligations, such as the annexation of Crimea," Steinmeier said, referring to Russia's annexation of the Ukrainian peninsula. He added that "there is no alternative to the Minsk process aimed at finding a solution to the crisis in and around Ukraine." Russia, a participating state in the OSCE, has been accused of backing anti-government rebels in Ukraine's eastern regions. The conflict erupted in 2014 after pro-democracy protests in the nation's capital Kiev led to the ouster of Kremlin ally former President Viktor Yanukovych. Steinmeier called on actors of both sides of the conflict to allow greater freedom of movement in areas impacted by the conflict. Both Ukrainian government forces and rebels have been known to impede the monitors' ability to move in key areas. "OSCE observers in Ukraine require our full support," said Steinmeier, adding that the mission's mandate needed to be prolonged as a political solution to the conflict is established. The Canadian delegation to the OSCE described Steinmeier's vision for the OSCE as "comprehensive, ambitious and principled." In its program for the OSCE chairmanship, the German foreign minister said that it will focus on renewing dialogue, rebuilding trust and restoring security" during "one of the severest crises in Europe's security order since the end of the Cold War."